I’ll let the reader meditate on this quote, and the irony of the JNF’s —and the broader Diaspora Jewish establishment’s — admiration for the legacy of the Civil Rights movement in the United States. Even one of their forests in the Galilee is the Corretta Scott King Forest. The Civil Rights Movement was predicated on the violation of unjust ‘’democratic’’ laws. Robinson also writes that ‘’Those who use the term ‘judaizing’ insult the men and women who perished fighting for our democratic Jewish State of Israel.” I wonder if he realizes what he is saying about the administrators of the City of David, backed by virtually all levels of the Israeli politically establishment… [Read the full piece on +972 Magazine]. 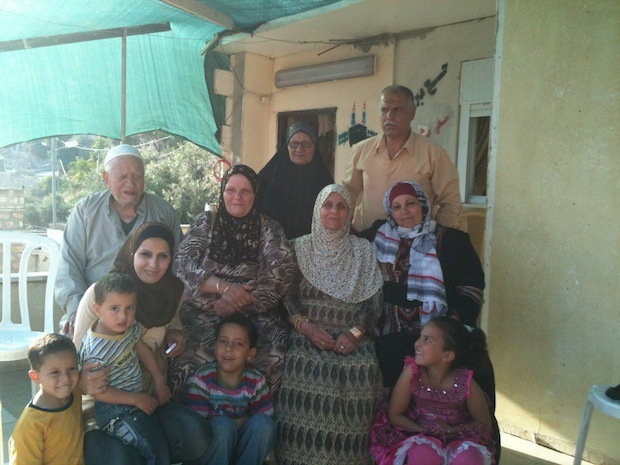 The Ruweidi family outside their home in Silwan, East Jerusalem, after hearing news of their victory in the District Court. May 9, 2012.